The service teams at Bluesky Communications, in Samoa and American Samoa have been celebrating Customer Service Week for several years. In 2014, there were teambuilding activities, recognition events, and a unique activity to reinforce the Bluesky service values. On each of four consecutive days, the Bluesky family was asked to dress in the color of the day. The colors were blue, orange, purple and white — the colors of the 2014 Customer Service Week logo. While the colors brought the logo to life, Bluesky also found that each color had a deeper meaning. 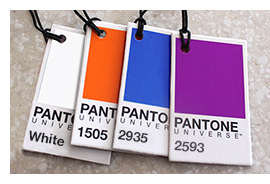 For example, blue symbolizes trust, orange represents enthusiasm, purple is associated with creativity, and white is considered to be the color of perfection. Each day, and each color, provided an opportunity to focus on providing service that is trustworthy, enthusiastic, creative, and perfect! Last time, we shared details of a very sweet and motivational Customer Service Week goodie bag. This time, we have another special goodie bag created by an international law firm for their customer-facing staff. But goodie bags arent just for Customer Service Week. Anytime of year, you can thank staff and make important points with a special bag of treats. The law firms goodie bag included eight items, each of which represented an important reminder for frontline staff. Lifesavers - To remind you that you have the power to save the day. Laffy Taffy - To remind you to find the humor in difficult situations. 100,000 Grand Bar - To remind you of the value of each customer to the organization. Chewing Gum - To remind you to stick with problems to the very end. Fortune Cookie - To remind you that theres always something good to look forward to. Small Piece of Red Carpet - To remind you to roll out the red carpet and provide excellent service to all customers. Super hero figure - To remind you that by delivering consistent and reliable service and flawlessly executing on customers requests, you have the power to be a super hero in the customers eyes. 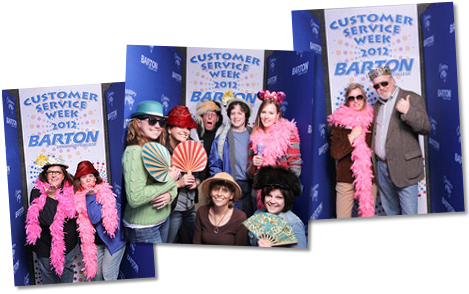 After a 10 year hiatus, Barton Community College was ready to begin celebrating Customer Service Week again. This time the festivities involved college staff from all of the departments on campus. To ensure that everyone could participate, the event featured several activities that were repeated throughout the week. For example, the popular FISH! video was shown on Monday, Tuesday, and Wednesday in both morning and afternoon sessions. And stress reduction training was presented on Monday and Thursday in both the morning and afternoon sessions. Not only were participants informed and motivated, they were also entered into a prize drawing each time they attended an activity. The week came to a close on Friday with a one-time only ice cream social complete with photo booth. Plenty of hats, sun glasses, and boas were available to create a special memento of the week. Theme days have always been popular during Customer Service Week — from the 60s, 70s, and 80s, to superheroes, to team jersey days. But at Demag — A Terex Brand, theme days took a decidedly more serious tone. 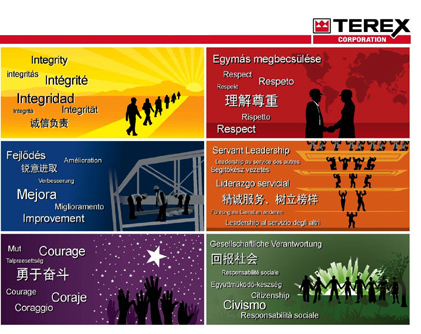 The company has six core values, each of which is represented by a different color: Integrity, Respect, Improvement, Servant Leadership, Courage, and Citizenship. 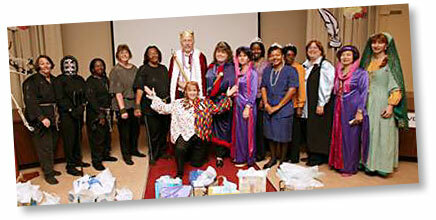 Each day of the week, employees celebrated a different core value. They did this by dressing in the appropriate color and reflecting on the actions taken by their peers, which exemplified the daily value. Customer Service and Spare Parts Manager, Tricia Ater, explains that this was not a contest, it was simply a way to focus on these important values and to illustrate that small actions can bring the team closer to achieving each value. To encourage participation, each day one of the many reflections that had been submitted was randomly drawn and the person who was commended received Demag dollars. The game was created to focus attention on positive attitudes and positive word choices all while having fun. Each team member started the week with a good supply of colorful Mardi Gras beads. At the end of the week the team members with the most beads received prizes. But there was a catch: Any rep caught saying cant or wont during the week had to give a strand of beads to the person who caught the lapse. And whats Mardi Gras without a parade? The team also enjoyed a chair decorating contest and then paraded their creations — lead by the Mardi Gras King and Queen — around the building. Fun, games, teambuilding, rewards, recognition. But is there a place for training during Customer Service Week? You bet there is. In fact the week provides a great opportunity for your team to recommit themselves to the service mission and to honing their service skills. Thats just what the team at the Orange County Clerk of the Courts in Orlando, FL, did. Each day the team focused on a particular skill and the managers who monitored calls were there to coach, recognize and reward team members for their focus on the daily skill. Greeting: Focus on greeting the customer with a smile in your voice. Listening: Focus on what the customer is really saying. Closing: Focus on all of the elements in a proper closing. Empathy and Courtesy: Show the customer you care by being upbeat, friendly and patient. And while the team focused on improving their skills there was also plenty of time devoted to a kick-off pancake breakfast, chair massages, service crossword puzzles, service bingo, office Olympics, and other fun activities. When NorthStar Capital Markets Services held its first Customer Service Week celebration, the week was packed with creative activities that focused on team building, training, and just plain fun. Two of those activities combined fun with a purpose. The first focused attention on the importance of two-way communication, and the second on vocal tone and quality. In the first activity, reps were divided into teams of two to complete a series of challenges, which required both trust and excellent communication skills. The blindfolded person was instructed to draw specific shapes on a flip chart. To get it just right, the leader had to give very clear and precise instructions. For a more tactile task, the leader guided her blindfolded partner to place a stone in the correct position among other stones on a tray. And for the more athletic, the leader guided her partner in an attempt to toss a foam football into a bin. To wrap up the event, the blindfolded rep pushed her partner, in an office chair, through an obstacle course. At the finish line, they celebrated completing the tasks together. The second featured activity focused reps attention on the importance of vocal tone and quality. In this experiment, reps were asked to call their desks and leave themselves a simple message. Next, reps were asked to leave themselves the same message but this time to stand up, smile and face the person next to them when speaking. At John Hopkins Healthcare, a relatively simple and low-cost Customer Service Week activity helped focus attention on service goals and brought the team closer together. The only materials needed are 5" x 7" cards with each reps name and a border of stars, plus a hole-punch. 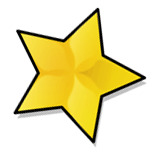 Without any prior explanation, supervisors and managers began punching holes in the stars and initialing reps cards. As the week progressed, supervisors and managers began dropping hints as they punched and signed their way through the department. Compliments such as Hey that was a great ending to a call or Thanks for helping the new rep with that tough problem could be heard throughout the department. By Wednesday, supervisors and managers were asking groups of two or three reps questions on departmental policies. Every correct answer earned the rep a hole-punch. The mystery was finally solved on Friday when all of the cards were turned in and reps received tickets for prize drawings for each hole-punch they had received. At the Virginia Department of Transportation training is both educational and fun during Customer Service Week. 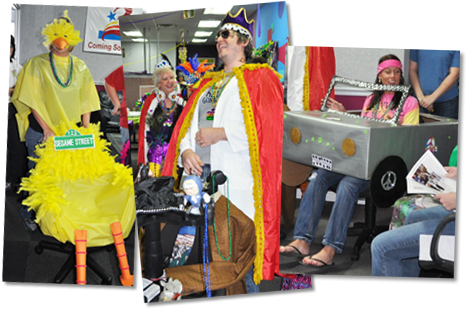 As in the past, the customer service committee hosted a Video Day in which decorations, costumes and snacks all reflected the theme of the training video. This years selection was The Royal Treatment, a humorous videotape set in days of yore, which brings the idea of treating customers like royalty into todays workplace. Guests entered the auditorium where the video was shown by crossing a wooden drawbridge. Once inside, they found that half the room was decorated like a dungeon and half like a castle. Members of the customer service committee were dressed appropriately as characters from the movie, including a king, executioner, and jester. As guests left the auditorium, they received magnetic cards that had been imprinted with the committees formula for giving every customer the royal treatment. The highlight of the weeklong celebration at Cambrex Corporation was a special activity, which turned frontline reps into customers and gave them an opportunity to benchmark their service against other organizations. Only one item may be purchased per store. Each person on the team must purchase each item. A salesperson must be consulted at each store. 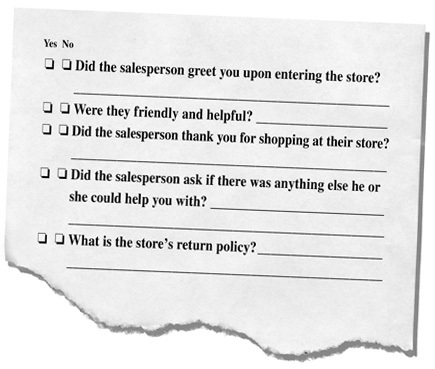 A customer service evaluation form must be completed for each store. Later, the entire team met to review their completed evaluation forms, to discuss areas where improvement could be made, and to determine lessons learned that they could transfer to their own operations. While the Cambrex team chose to shop in the local mall, this eye-opening event could just as easily be adapted to telephone or online shopping. And just in case youre wondering what happened with all those items that were purchased — they were given to the reps as thank-you gifts!